The Wharton Risk Center researches and evaluates strategies for risk communication, risk reduction, and risk transfer. The direct and indirect impacts of climate change — activities to limit future emissions of greenhouse gases, and activities undertaken to adapt to climate change — are all likely to have major implications for the insurance and financial industries. Approaches toward infrastructure policy in the United States have evolved over the past century from an initial emphasis on infrastructure adequacy, to a move toward deregulation with the aim of increasing efficiency, to a recent focus on infrastructure protection. Each year, the United States spends billions of dollars on federal disaster assistance – funds used to help state and local governments, households, and business and non-profit organizations recover from natural disasters. Since 2005, the federal government has spent more than $300 billion on disaster relief — most of which is off-budget and only provided after a disaster through emergency supplemental appropriations. 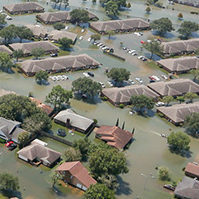 The Wharton Risk Center is working with its partners to examine alternative programs for reducing losses from natural disasters and providing funds for recovery following a catastrophic, particularly the role that the private and public sectors should play in mitigating future disaster losses and financing the recovery process. Underlying public cries for better or increased inspections that often follow an industry disaster or near-disaster is a fundamental problem of virtually every regulatory agency and regulated industry: the number of regulated firms far exceeds the resources of agencies to inspect those firms. Research at the Risk Center is directed towards examining the value of enhancing the role that third-parties play in implementing regulations.